Lypheng Kim was 10 years old when he saw a man get shot in the head. He had been playing outside his apartment in South Philadelphia when violence ensued just feet away. It wasn’t safe to go out at night where Kim grew up. Many childhood friends remain in the neighborhood and now have kids of their own or are involved in gangs. Some of their siblings are in prison or dead — the victims of street violence. Kim’s own cousin has been on the run for years due to gang-related activities. The 21-year-old’s life story, which touches on race, class and immigrant status, places him at the heart of America’s political and social divides. Kim’s career goal is to be a nurse practitioner. He works to ensure students of color feel like they have a rightful place at USC, which is moving to shake its “University of Spoiled Children” image by increasing diversity and equality initiatives. Lypheng Kim came to America with his family when he was 7 years old. His mother Sreytouch Chheang and father Sam Kim survived the Cambodian genocide under the Pol Pot regime, when roughly 1.5 million of the 8 million Cambodian population died of starvation, execution, disease or overwork. Kim’s family members were forced to work in the rice fields and were constantly hungry. They lived in fear of dying or getting killed, and watched as many around them perished. Kim’s mother would remind him of the regime-rationed food — a spoonful of rice a day — and told of her mother dying from an untreated illness. His father spoke of seeing his brother taken to a field and shot dead before his eyes. After the genocide, Kim’s parents met through an arranged marriage. They bore two sons, younger Lypheng and elder Lychhay, and decided to seek better lives for themselves. After arriving in America, they worked two or three jobs at first, usually in factories. Since the parents don’t speak English, Lypheng and Lychhay still translate documents and file the family’s taxes. “For them, unconditional love was just raising us,” Kim said. Everything else, like getting through school, was on the boys. “As a kid, when I watched television, I’d see examples of parents helping their kids with homework, and I didn’t have it,” Kim said. School also proved to be a battleground for bullying. A lot of kids would make fun of Kim in elementary and middle school because he is gay. The lack of acceptance throughout childhood took a toll on his mental health. He says he experienced depression at a young age and contemplated suicide. And even if he wanted to discuss his feelings more deeply with his parents, Kim says he doesn’t have the language skills. Moreover, his parents struggle with PTSD from the genocide, and Kim doesn’t want them to internalize his problems, too. Another major hurdle for Kim growing up was finding his path to higher education. 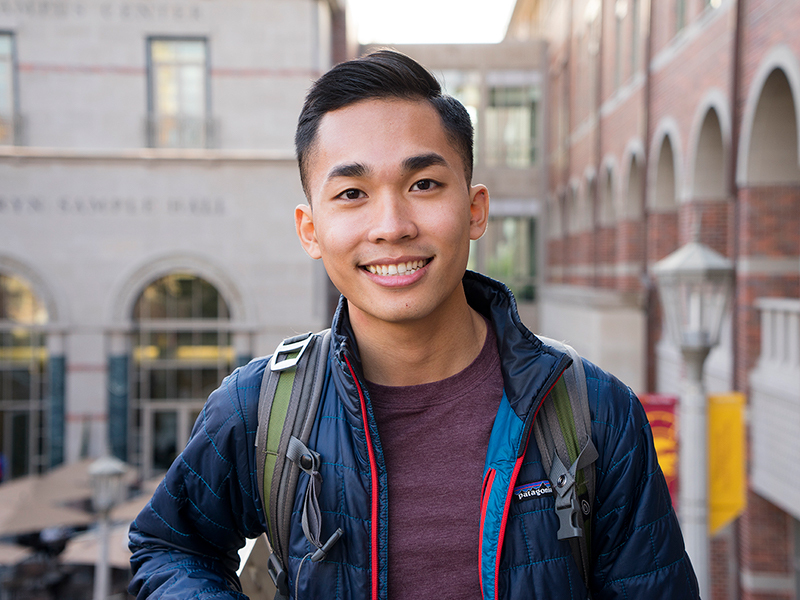 When he was in elementary school, Kim’s mom told him he would have to pay his own way through college if he decided to attend. For high school, Kim attended Mastery Charter School, Thomas Campus, a place “notorious for producing lower-end test scores,” he said. Kim had many Teach for America instructors, and around half the school’s staff would leave each year. As a senior, Kim took classes at community college and prepared himself for life after graduation. He decided to apply to the Gates Millennium Scholars Program, a highly selective initiative that provides college scholarships to minority students throughout the country. With the logistical question of how answered, Kim then had to decide which university to attend. He finally chose USC, declaring a human biology major. Kim’s introduction to higher education wasn’t easy. A particularly painful blow came when Kim was told of the fate of one of his childhood mentors. While it’s still tough at times, therapy proved useful, Kim said. Still, despite everything, or perhaps because of it, the college junior typifies the well-rounded USC student. Kim often speaks at LGBTQ events and has been featured on media outlets like BuzzFeed with the aim of shattering stereotypes. He’s a member of the dragon boat team, which offers some escape from his campus activities. He serves as the Diversity Liaison for the Asian Pacific American Student Assembly and was a teacher’s assistant for Critical Issues in Race, Class, Leadership Education. This is only the second year that the diversity liaison position has existed. Kim’s goal is to work with the Undergraduate Student Government’s Diversity Affairs director to strengthen ties with the Asian American community. He’s working on a video project to educate people about the complexity of the Asian American identity and to debunk the model minority myth. “Often times media has shown Asian Americans as one-dimensional and has kind of placed us in a box that stereotypes what it means to be Asian American,” he said.